Sorry for the delay in posting again, it’s been a very hectic week as always! I’ll be trying to catch up over the next few days. We were blown away by the cabin when we got there, it is very beautiful. 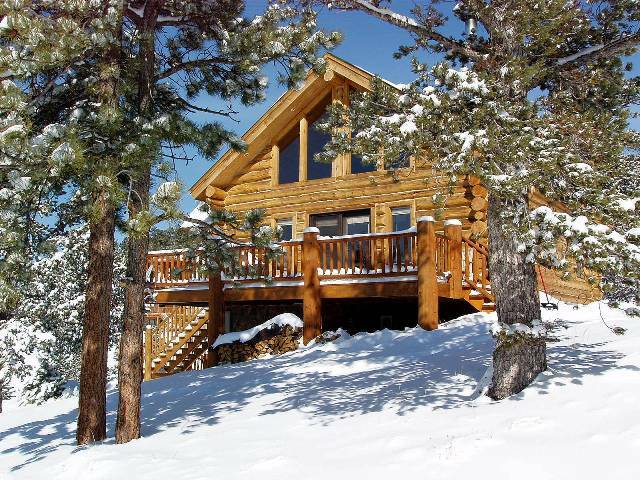 We were too distracted running around in the snow to get a good picture of the cabin, but here is a similar looking one from Google! Like this but bigger, cooler and with more snow! Snow depth = 4 feet. Trousers = not waterproof. We kept it up for about an hour before the snow in the face started to result in complete numbness, at which point we retreated to the restaurant for hot chocolate. We choose to get the hot chocolates with a dash of peppermint schnapps, although these turned out to be about 70% schnapps. It was like drinking slightly chocolately, very thin toothpaste, but it did warm us up pretty quickly! We were all very relaxed by the time we got back to the cabin for relaxation, dinner and the movie Avatar. The next day, we went Snowshoeing! This is where you wear snowshoes to spread your weight out a little, so that you can go hiking through very deep snow. We got to borrow some snowshoes, so strapped them on and off we went! Our feet felt very heavy and it took us a little while to get used to walking around in them, but it was very cool once we got the hang of it! We then went for a beautiful hike around the lakes, although since all the lakes were frozen and under a few feet of snow we didn’t actually see any. I did see a Blue Jay though, so very proud of the first bird spot since we got here! We walked for a total of about two hours, and it was very pretty and very quiet. It’s actually a little eerie how quiet it is, but very relaxing. I can definitely see why authors have mountain cabin retreats for when they need to go write books, it was very serene. We were very sad when we had to head back down to Fort Collins, although we were definitely a little relieved to be back at a lower altitude with at least some moisture in the air. We’ve offered to go and help cut down some trees if they need it sometime, so hopefully we were well behaved enough to get invited back again soon!